A stand-up meeting is a quick, to the point meeting that is at the core of the lean management philosophy. Essentially, everyone is standing up throughout the entire meeting which lasts only about 5-10 minutes. When its their turn to speak, they say the most relevant information for the day in order to inform the others. When the meeting concludes, each person goes off in their respective directions to begin or continue their work for the day… It’s that simple. Studies show: Stand-up meetings became increasingly accepted when remarkable research from nearly two decades ago was published in the Journal of Applied Psychology, reporting that stand-up meetings take 34% less time and produce the same results as a sit-down meeting. So, here are 8 rules and examples to help you bring stand-up meetings to your company or at least take them to another level. Yesterday: What did I do? Today: What will I do? Concerns– Are there any issues blocking my progress that the team can help me with? As a side-note: you can iterate the theme to suit your business culture and objectives. The content is flexible, but remember to keep the timeframe restrained. If there is an issue or concern where one employee can help the other, this is to be addressed directly between them after the meeting so as not to take away from the time of the entire group. The Kanban board is a commonly accepted note-taking system used by many companies, across a variety of industries. There are columns that correspond to the questions addressed in the meeting and notes are generally recorded by placing a sticky note in the relevant column. Taking notes is important because it can be difficult to remember what each person said during the meeting, especially when the meeting runs at such a fast pace. To learn more about Kanban boards click here. As a side-note: Kanban is also a type of system within the manufacturing process. 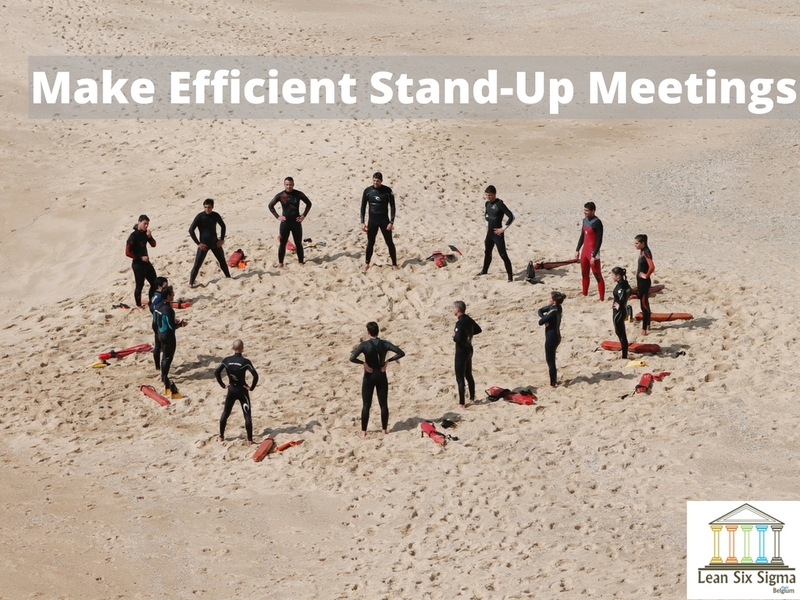 The overall purpose of the stand-up meeting is to host something quick with dynamic energy that brings the team together. A side benefit is building cohesion and long-term trust. Also, embracing the dynamic energy inherent in the stand-up meeting philosophy saves the company from unnecessary repetition and redundancy in its procedures and approach. It is noted that in 2011 Kristen Gil, Google’s Vice President of Business Operations had the company reassess its goals and undergo broad change. One of the lessons learned was to keep meetings limited to 10 people. Consider what is best for your team, company and culture. Remember, just as time is a factor, so is the number of attendees. Stand-up meetings are an art form. Staying up to date is key. One aspect of learning how to have an effective stand-up meeting is reading what mistakes to avoid. For example, many people believe that it’s not good to have a stand-up meeting outside of the office because there will be no board to record the ideas or take notes. This belief is erroneous because technology is progression such that there are electronic options available to accommodate. In such a quick meeting, positive energy is crucial because it can color the remainder of the day for someone. If there is an issue, discuss it professionally and directly once the meeting has adjourned. Otherwise, keep the vibes optimistic and aim towards the larger goals. Sounds simple, eh? You’d be surprised. Stand-up meetings are a form of communication that are important for business operations and serve as an opportunity for joining together distant members of the team. There are many variations and methods to incorporate into a stand-up meeting which takes observation and skill just as any other aspect of business does. With enough practice and dedication, the benefits will be reaped. If you enjoyed this post, we would be very grateful if you’d help it spread by emailing it to a friend, or sharing it on Twitter or Facebook. Thank you! Are you a Lean Six Sigma Leader ? Achieving Operational Excellence in the Public Sector: Can You Apply Private Sector Thinking? © 2019 Lean Six Sigma Belgium. All Rights Reserved.